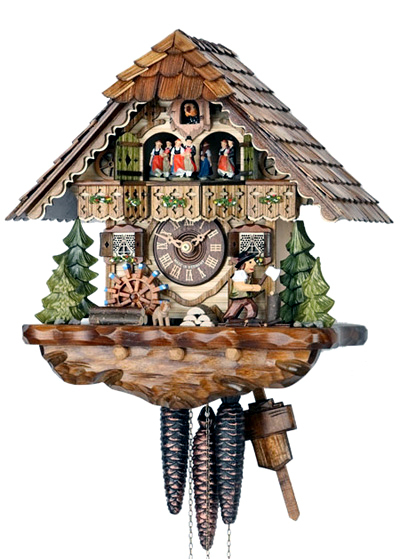 13 inch new musical 1 day chalet cuckoo clock by Hekas with wooden hand carved moving woodchopper. Clock also features turning water wheel . 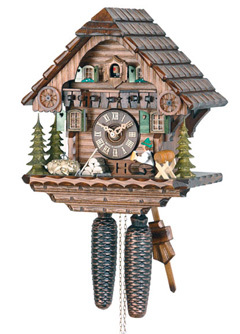 Clock has roof with 100 hand cut shingles, wooden dial, numerals and cuckoo bird. Beautifully crafted clockcase with 2 tone woodwork. Clock plays 2 tunes and features night shutoff.